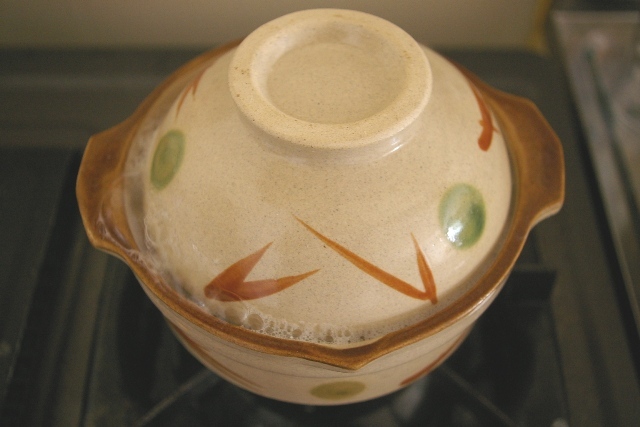 Today most Japanese people use rice cookers, but in the past they used to cook with pots. Now, cooking rice with pots is re-evaluated. Actually it’s faster, energy-saving and enhancing the flavor of rice than using rice cookers. Wash rice gently. Add water up to the last knuckle of your middle finger with your fingertip touching the rice. Soak the rice for a while (approx. 30 min in summer, 1-2 hours in winter), which is important to bring out the sweetness and stickiness of the rice. Put the lid on and start at high flame. When it boils, set to low flame and boil for approx. 10-15 min. While cooking, you will hear the bubbling sound at first, then it will change to the crackling sound. It means it’s time to turn off the heat. After turn off the heat, the pot with the lid covered for 10-15 min for steaming.